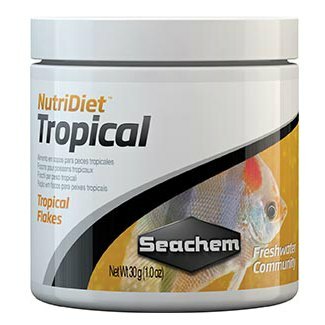 Seachem NutriDiet Tropical Flakes are formulated to provide all of the essential nutrients for tropical fish. As with all of the Seachem NutriDiet products, Tropical Flakes have Chlorella Algae as an exceptional source of a broad range of vitamins, amino acids as well as all other nutrients required for animal life. Chlorella Algae is considered a potential super food that surpasses the nutrients delivered by Spirulina Algae common to other diets. Also, Tropical Flakes contain GarlicGuard™ as an appetite stimulant and a natural antibacterial/antiparasitic product to protect tropical fish from the myriad of infections and infestations of bacteria and parasites. Vitamin C allows for enhanced immune function and collagen production and thereby tissue repair and growth. Natural colour enhancers assist in making the most of the potential colour of any tropical fish. Tropical Flakes also contain probiotics which allow for more rapid and simplistic digestion of the partner nutrients. The fish use less energy digesting the food. Waste production is lessened because the food is digested better. This also allows for more nutrient uptake and increased immune function. Finally, patent pending compounds completes the formulation to enhance immune function further as well as extend life potential, promote natural growth, and enhance the colour of fish.